The North Carolina Dames scrapbook includes a newspaper article about Watauga. Watauga was first established in 1772 in North Carolina’s western frontier. The Watauga Settlement is also seen as the first American settlement west of the Appalachian Mountains. The people of Watauga created their own government separate from the U.S. and made treaties with local Cherokee, though this was illegal in the eyes of the U.S. government. 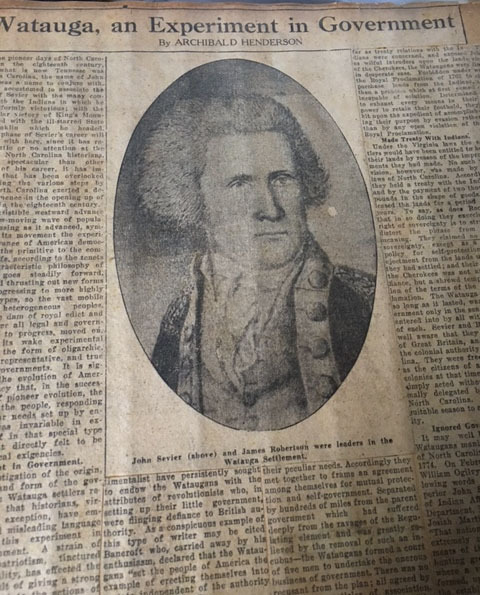 John Sevier and James Robertson were the leaders of the settlement. The Watauga Settlement was renamed Washington District and became apart of North Carolina in 1777.